We sold this truss dock system to Curtis in Washington. His company, LTJ Builders Inc., were given the job of replacing a rotted out wood dock on a lake in the state of Washington. The dock system comprised of two 8×16’ truss docks (bolted together into a 16×16’), one 4×12’ walkway and one heavy-duty swim ladder. 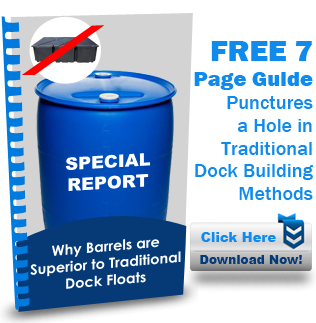 The system used a total of 24 barrels and opened up 256 square feet of dock space.